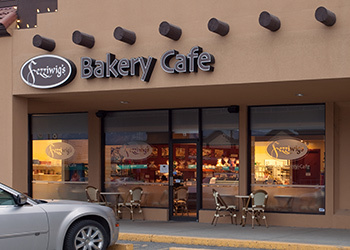 Fezziwig’s is a bakery, cafe and catering company located in Kelowna, B.C. We opened March ‘06 with a vision to serve nourishing home-style meals in relaxed surroundings. We serve delicious hot breakfasts and great lunch choices. If you have an event coming up and need information for catering, we can help with that. As well, because we care for the environment, we only uses biodegradable packaging. Mr. Fezziwig is the well-loved character in Charles Dickens ‘A Christmas Carol’. You meet him when the Spirit of Christmas Past reminds Scrooge how much his first employer loved life and all things joyful. Like Scrooge, you will enjoy a feast for the senses when you visit Fezziwig’s. We currently have three locations: Mission Park Shopping Centre (WiFi available), Guisachan Village Centre (WiFi available), and the Okanagan College. For hours and contact information, please visit our locations page. Our ingredients are locally sourced and wherever possible, organic. Everything is made on site at our bakery-cafe, fresh every day. We buy our coffee from Cherry Hill Coffee, it’s freshest and tastiest coffee in Kelowna.